I have salad most days for lunch at work so to make sure I don’t get bored, I like to change it up every now and then. As I’ve mentioned before, I often bring in my ingredients on the Monday and make my salads fresh every lunchtime, but there are just some days when I don’t remember to bring everything in from home. This is my go to salad for one of those days. 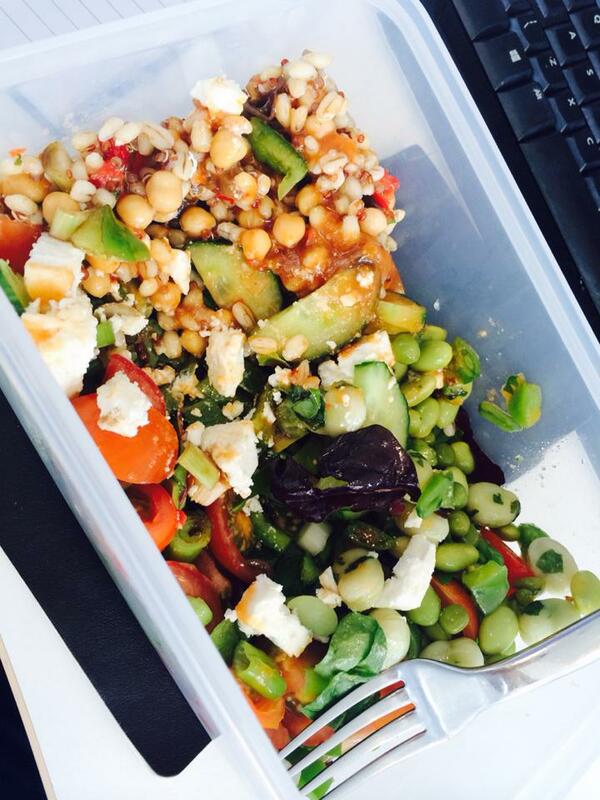 Tesco have got a great range of salad ingredients and accompaniments so I know that if I’m short, I can pop out and pick up their edamame bean and pea salad and chickpea and aubergine salad quickly and that it will make a satisfying and healthy lunch. When I buy these two together, they last a good three days and added with feta and the other salad ingredients, it makes for a nice change from my regular cous cous and chicken staple. The feta goes so well with it that I don’t even mind that it’s actually a veggie recipe! Pop the salad leaves in the bottom of a large bowl (or lunch box if like me, you want to take it to work). Add all of the salad vegetables on top of this and add a glug of balsamic vinegar and toss a little. Next pop in the edamame and chickepea salads as well as the feta, top with a little of the dressing that comes with the bean salad, combine and season with salt and pepper. Creamy Mustard Baked Chicken with Roast Potatoes and Green Beans – only 11sp! Made this this week and it was top nosh!